I realise I haven’t posted any recipes on the site recently. This is not through lack of baking; those of you who follow me in on Instagram will know that chocolate cake was a rather dominant feature during January as Junior Wannabe turned a decade old mid-way through the month. But chocolate and sugar, while delicious, are not what this blog is about. Well, chocolate maybe (it does have health benefits after all), but I try to avoid the sugar (on the site at least). So let’s step away from the sugar bowl before I’m tempted to rustle up a chocolate brownie before we know it and focus on something that’s a bit better for us, at least in body if not in soul. In an effort to reduce my intake of processed bread I recently decided to make my own flatbread and discovered just how easy it is. While I love to bake a proper loaf, it does take a while and, seeing as the Wannabe household gets through at least a loaf a day, I just don’t have the time for it on a daily basis. Flatbreads are the way forward I’m sure. You can make a batch of them in half the amount time it takes to even prove the dough for a loaf, store LOADS in the freezer (unlike loaves; air takes up space you know) and best of all they are delicious. This one goes well with the soup I featured last week; in fact, I used the leftover sweet potato from the soup to make this bread. Having made my traditional flatbread recipe a few times recently I thought I would branch out and experiment. This is a healthy version made with sweet potato which is an excellent source of vitamin A (in the form of beta-carotene) and also of vitamin C. Sweet potato also has manganese, copper, pantothenic acid, potassium, fibre, niacin, B vitamins and phosphorus. All good stuff. 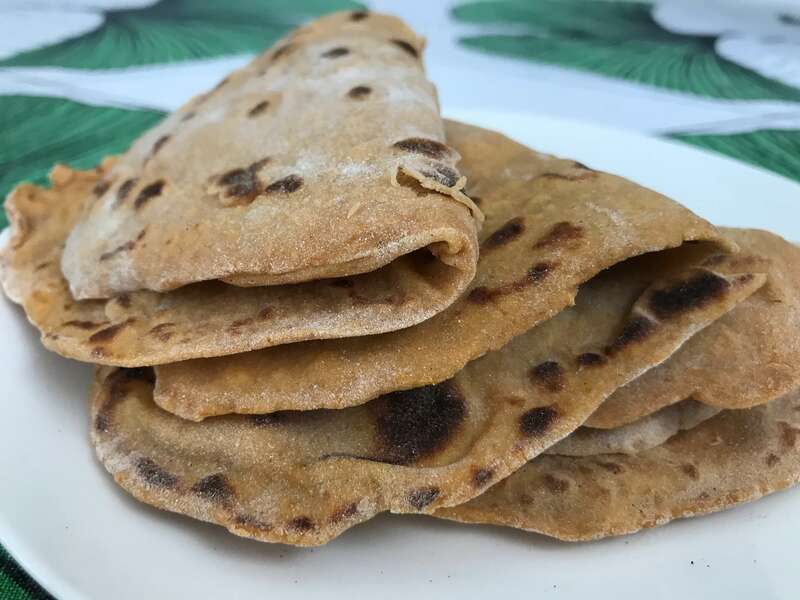 To make these flatbreads even healthier I’ve used buckwheat flour which is gluten-free. According to Dr Claire Bailey in The Clever Guts Diet Recipe Book, many gluten-free flours are often white and highly refined and lack the fibre needed for a healthy biome. She recommends buckwheat flour as one alternative. So that’s what I used. Eat immediately or store in freezer until needed. To be honest, these flatbreads were relatively difficult to handle compared to the more traditional ones I’d previously made: sticky and tricky until in the pan. I’m not convinced they were tastier than traditional flatbreads, but they are undoubtedly healthier. The Wannabe Husband declared them “very edible” which, coming from someone who usually views “healthy” food with a healthy degree of suspicion, I took as a compliment. Have you ever tried to make your own flatbreads? I will be posting my favourite flatbread recipe soon so please subscribe to my newsletter if you don’t want to miss out. It’s easy (that goes for both the recipe and the signup). Promise. Oh yum! This looks like something baker (non-cook) me can handle and I adore sweet potatoes! I also eat as gluten-free as possible because of having hypothyroidism. Keeping the gluten out seems to help the body function better. Off to the store for a potato! Good luck RoseMary – let me know how you get on! I am not gluten intolerant but also coming to the realisation that a gluten-free diet seems to help the body function better. I plan to post more gluten-free recipes on the blog soon. Any requests?